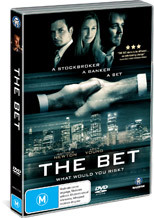 This intriguing Australian thriller revolves around two Sydney stockbrokers who make a bet in order to see which one of them can make the most money in 90 days. Directed by Mark Lee, the movie is reminiscent of Wall Street with its sophistication and restlessness as two men attempt engage in a variety of almost nefarious means in order to outdo each other. Matthew Newton stars as Will, the young and upcoming stockbroker who makes the deal with Angus (Aden Young), an older more streetwise stockbroker. However when Will’s girlfriend Tori (Sybilla Budd) finds out about the bet, she tries everything to convince her boyfriend to get out of this dangerous mistake as the tension builds with Will bordering on the thin line between legality and illegality. The actors are quite impressive in The Bet, especially Newton who really embraces this character that at times seems like a carbon copy of his real persona. Featuring great Australia cinematography, the picture and video quality is quite high that makes the DVD an almost movie-like experience that we could recommend to those viewers who enjoy a decent thriller. Even better... it's Australian! Definitely one to check out!